SlipSuit Sleeves are made of extra-thick EVA with reinforced corners to help protect your laptop, whether you’re a business traveler, student or urban commuter. 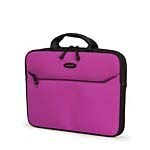 Use the nylon carrying handles to carry like a briefcase, or slide it into a larger bag for easy storage. Featuring a large zippered exterior front pocket for your power supply, and heavy-duty zipper pulls, the SlipSuit ensures both mobility and protection. The water-resistant EVA material ensures your laptop is protected wherever your travels take you.